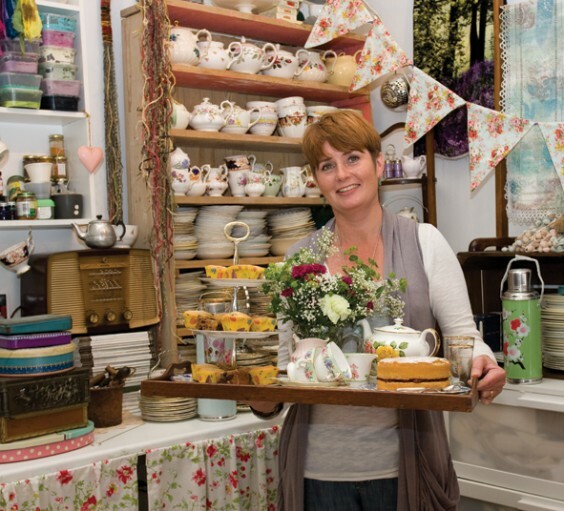 It’s almost a year since we reported on the launch of Constance Wallace, an unusual local business based at Tardebigge Court and founded on owner Diane Cooke’s love of all things vintage. The concept of bringing the traditional English tea party back into people’s homes, complete with vintage tableware and handcrafted decorations, has taken off in a much bigger way than Diane could have imagined – meaning she has been able to turn her creative mind to some new ideas. The latest of these is vintage tea parties especially for children, which are proving a big hit. These take the same form as the adult versions – Diane brings along her china and tableware as well as traditional treats such as cakes and sandwiches – but are tailored to younger party-goers. Diane is keen to point out that a tea party can be adapted to suit almost any occasion from birthdays to weddings to funerals, and she can cater for small groups or large gatherings as well as offering a vintage china hire service. She recently served tea and cake for 80 people over a two-day corporate do, and has just taken a booking for a party of 100 people, but is equally happy to arrange “tea for two”. This has proved popular with a number of clients, including a housebound lady who wanted to celebrate her Ruby wedding anniversary. Diane made it extra special by making name cards for the table and bunting with red roses. The fact that Diane, who has an MA in printed textiles, creates these handcrafted accessories makes her tea parties even more special and unique, and of course clients can also purchase items such as bunting and pinnies in vintage fabric, knitted tea cosies and even brooches made from fragments of broken china. She particularly enjoys this aspect of giving new life to old things, from tea cups sourced from house clearances and antique shops to blankets and linen cloths, which she transforms by hand-dyeing them. “I don’t like to throw anything away!” she says, and indeed one of her latest ideas has been to rescue old deckchairs, recanvassing them in vintage fabrics before hiring them out for garden parties. Also on an outdoor theme, Diane has a number of vintage picnic hampers which she will pack with picnicware and food for a day out, and this summer she made up special picnic boxes for a child’s fifth birthday. However, tea parties are not just for summer – Diane also arranges winter versions, where guests snuggle up in blankets for a pyjama party (she’s doing one of these for a local hen night) or enjoy mulled wine and mince pies at Christmas. Meeting people and being part of the local community is one of Diane’s favourite aspects of the job, and she recently lent her services to a fundraising coffee morning for Macmillan as well as a Titanic-themed tea party for youngsters at Tardebigge First School. Unsurprisingly, she receives plenty of word-of-mouth recommendations, and it looks as though this friendly local business will continue to grow.